Nestled in the Cleveland National Forest between Lake Elsinore and San Juan Capistrano you can relax at our picnic area to enjoy our handmade sandwiches, root beer floats or hydrate after a long hike. Stop by and indulge in our vast candy selection from handmade fudge and pies to nostalgic candies like Chuckles and Mary Jane's. We love that everyone can be a kid in our Candy Store. We strive to have something for everyone, offering Gluten Free, Sugar Free and even Vegan candy and treats. 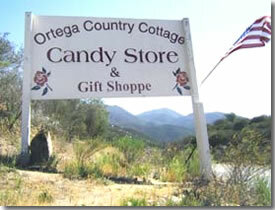 While camping at Ortega Oaks you have the convenience of a short walk to trail heads, waterfalls and the Candy Store for snacks, cold beverages, coffee and last minute necessities. We offer a variety of outdoor recreation information provided by the US Forest Service. Adventure passes available for purchase to take advantage of the great outdoors. Take a quick hike on the San Juan Loop trail, a 2 mile loop great for families or you can push yourself up to Sitton Peak through the San Mateo wilderness with a 360° view of the Ocean and through the Mountains to the Desert.